At Home in Arkansas. August, 2014. At Home in Arkansas. August, 2014. Showroom Photo. Life/DIscover. At Home in Arkansas. August, 2014. 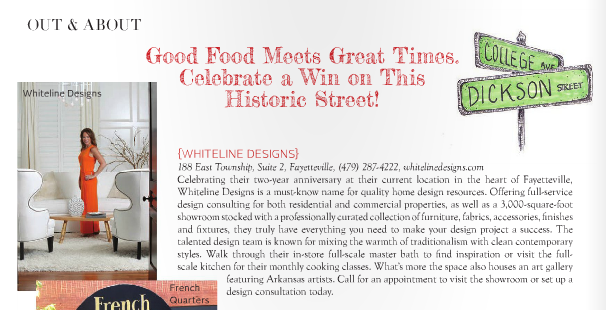 Local Favorites Interior Design. AY Magazine. May 2014. 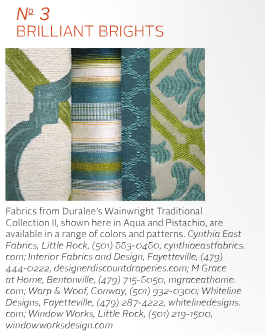 Voted #1 Interior Design Firm in Northwest Arkansas. At Home in Arkansas. April, 2014. At Home in Arkansas. April, 2014. "Simply Smooth". At Home in Arkansas. January/February, 2014. At Home in Arkansas. August, 2013. At Home in Arkansas. August, 2013. "Out and About/ Fayetteville". At Home in Arkansas. August 2013, "Interior Art-Water World". At Home in Arkansas. August, 2013. "Interior Art-Water World". At Home in Arkansas. August, 2013. "Interior Art-Soothing Serenity". At Home in Arkansas. November, 2013. At Home in Arkansas. November, 2013. "Industry Experts/Interior Designers" Feature. At Home in Arkansas. October, 2013. At Home in Arkansas. October, 2013. "Trending Textiles-Brilliant Brights". At Home in Arkansas. March 2011. At Home in Arkansas. March 2011. "At Home-Design News".